World champions Germany got their Euro 2016 campaign off to a winning start as they defeated Ukraine 2-0 in Lille on Sunday. Shkodran Mustafi and Bastian Schweinsteiger were on target for the Germans to ensure the nation went top of Group C on goal difference, after Poland beat Northern Ireland 1-0. Germany should have taken the lead in the 12th minute when Thomas Muller headed into the path of Jonas Hector, but the left-back wildly swiped at the opportunity. Joachim Low’s men did go in front on 19 minutes when Toni Kroos whipped in a fabulous free kick that Mustafi powered home with his head. Up the other end, Yevhen Khacheridi was frustrated by Neuer after he met Konoplyanka’s corner only to see the effort tipped over by the shot-stopper. 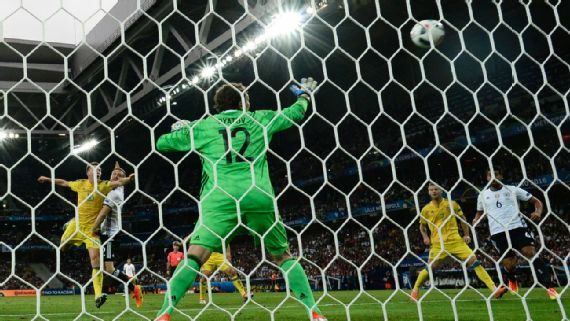 On 29 minutes, Ukraine goalkeeper Andriy Pyatov prevented it from becoming 2-0 when he made a smart stop to deny Sami Khedira, who had latched onto a fantastic Kroos through ball. Ukraine came within inches of levelling the scoreline only for Jerome Boateng to make an acrobatic clearance off the line, before moments later Andriy Yarmolenko was flagged for offside after putting the ball in the back of the net. Early in the second half, Julian Draxler stung the hands of Pyatov with a venomous strike, before Kroos had a shot from outside the box that whistled the wrong side of the woodwork. A Germany counter-attack saw Mario Gotze tee up Muller but the forward’s low shot was comfortably turned away by Pyatov.